(1) areas around volcanic mountains (Tharsis, Olympic Mons and Elysium). 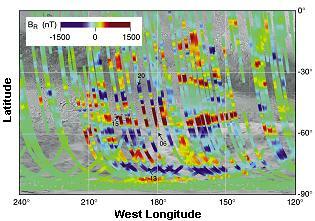 (4) and the probability that the northern surfaces formed during an era when Mars had a lower global magnetism. Rocks lose much of their magnetism with shock impacts and with volcanic heat. (Heat a magnet red hot or hit it hard with a hammer and you will observe this effect). 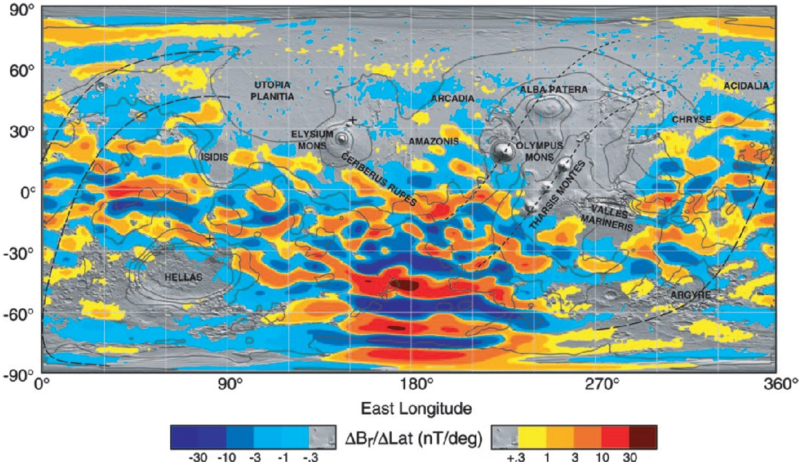 The plot shows that the magnetic stripes offset in areas with surface faults. These are areas where ridge lines are offset by transform faults. The offsets are traced out by the broken lines in the above map. 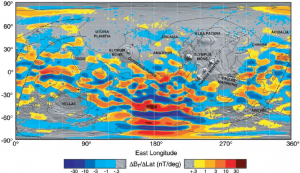 The faults /offsets trace out global sinusoidal features on the map. The global nature of these transform faults suggest that Mars has changed in size. Earth also has parallel magnetic stripes, surrounding an active volcanic rift in the bottom of our oceans. Hot lava continues to ooze out along the global rift forming new sea floor. In the Atlantic, the rift follows the contour of the adjacent continents and is half way between the continents. Earth’s magnetic bands alternate in polarity and are roughly symmetrical on both sides of the rift. They have irregular widths, contain islands of opposite magnetic polarity and may change polarity at different depths. All of these suggest that the magnetic stripes formed as the Earth continually grew in size. The gif of the growing Earth is courtesy of Michael Netzer. The Bible states in Hebrew that the earth continuously stretches out. Psalm 136:6 “To Him who spread out the earth above the waters. For His loving kindness is everlasting.” There is only one Hebrew verb in this verse. It is the word raqa. It means to beat out, stamp out, spread out or stretch out. This verb is an active participle that expresses an action in unbroken continuity. Isaiah 44:24b “I, the LORD, am the maker of all things, Stretching out the heavens by Myself And spreading out the earth all alone. . .” Again the spreading out of the earth expresses a continuing action. Isaiah 42:5 “Thus says God the LORD, Who created the heavens and stretched them out, Who spread out the earth and its offspring. . .” Isaiah used the verb raqa, to continuously pound, stamp and stretch out the earth. Isaiah says that what comes forth from the earth stretches out. This is more emphatic than just saying that the earth continually expands. This statement implies that the earth changes volume because matter itself changes volume. How could that be? According the Hebrew verbs of Zechariah 12:1, God continues in unbroken continuity to lay the foundation of the Earth.If you don’t understand the process of how God gave form to matter, read Creation Day One on this site. Earth’s continents fit together is on a much smaller globe. The deep sea floor is younger than the continents. A great expansion seam runs through every ocean, continuing to ooze out fresh sea floor. The expansion seam is surrounded by numerous offset transform faults that show how the Earth continues to grow in size. The transform faults point back to the opposing continents that used to be joined when the Earth was much younger. 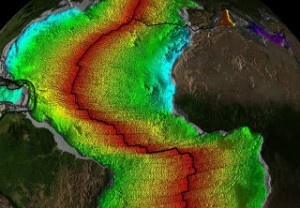 The image of the relative seafloor age is from NOAA. The youngest seafloor is red, then orange, yellow, green, blue and the oldest is purple. At one point, the only ocean was the Eastern Mediterranean, back when the continents fit together on a much smaller globe. The theory of subduction is denied by the soft layered sediments in the subduction trenches. If matter is changing itself relationally, changing its volume, its inertia and its clock frequencies together, objects would steadily change sizes and orbits. In such a universe, global magnetic bands on Mars would be evidence that ancient Mars was much smaller than modern Mars just like the ancient Earth was minuscule compared to the modern globe.